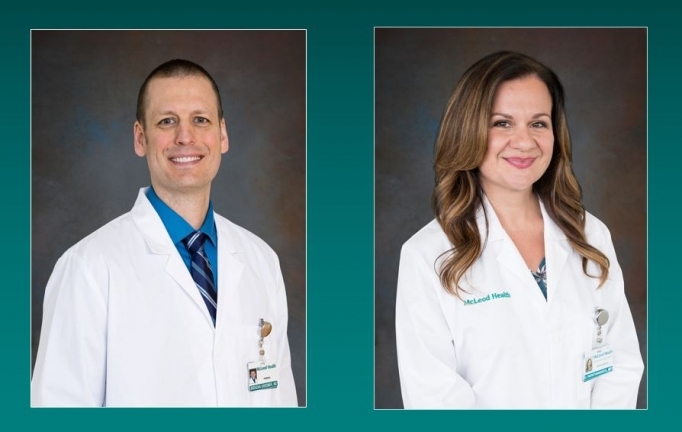 McLeod Health welcomes new physicians Dr. Brendan Griesmer and Dr. Viki Papathanasiou to McLeod Family Medicine Carolina Forest. Dr. Griesmer is an internal medicine physician with more than 13 years of experience caring for patients. He comes to the coast from The Cleveland Clinic where he practiced for seven years. Board Certified in Internal Medicine, Dr. Griesmer treats patients with a broad spectrum of adult health care needs, ranging from primary care to more complicated medical needs including heart disease, diabetes, lung disease, kidney disease and multi-system diseases. Dr. Griesmer’s interests include travel, classic movies, and his family. He lives in Myrtle Beach with his wife Nicole and daughters, Evelyn and Penelope. Dr. Vasiliki “Viki” Papathanasiou comes to the Grand Strand from Jersey City, New Jersey. She has more than seven years of experience as a family medicine physician. Board Certified in Family Medicine, Dr. Viki provides primary care for men, women, and children and enjoys forging relationships with the patients she serves. Dr. Viki enjoys cooking and working out. She lives in Myrtle Beach with her four-year old son, Leo. McLeod Family Medicine Carolina Forest is accepting new patients at 101 McLeod Health Blvd., Suite 201, Myrtle Beach, SC. For more information or to schedule an appointment, please call (843) 646-8001.